Common names are Africa pepper, pepper, red bird pepper, chili pepper, cockspur pepper, goat's pepper, pod pepper, red pepper, Spanish pepper, and Zanzibar pepper. Cayenne's first appearance in the history books is recorded in 1493, and its name comes from the Greek word meaning "to bite." Herbalist John Gerard reported its cultivation in Great Britain in the sixteenth century; and Maude Grieve in A Modern Herbal reports that it purges the system of bad humors. It was first introduced to Europe when Christopher Columbus returned from his voyages, although it was probably cultivated for centuries in tropical areas of the world. 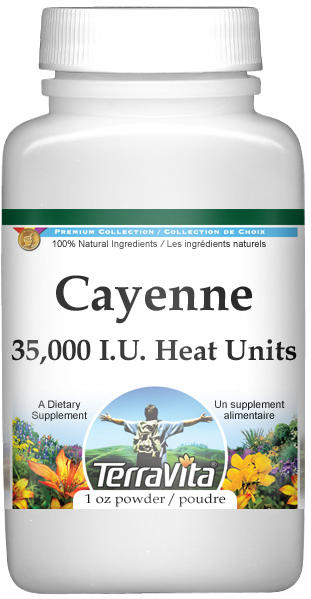 Cayenne is noted for its properties as a blood cleanser that also improves circulation. It aids in digestion because it stimulates the production of gastric juices and works to ease nausea and gas. It has powerful anti-inflammatory properties that are helpful in supporting joint pain, and migraine. It's said that a common cold can be removed by one or two doses of powder in warm water. Plant: A perennial in tropical areas, this is an annual when cultivated in temperate zones. Woody at the bottom and branching at the top, it produces drooping white to yellow flowers from April to September. The ripe fruit is a many-seeded pod with a leathery outside in shades of red or yellow. Height: To 3 feet or more. Soil: Likes fertile, rich, and moist loam. Propagation: Grows and tomatoes or eggplant from seed. It has a long growing season (14 to 18 weeks), so if you live in a region with a short growing season, start indoors from seed. Set out 12 to 18 inches apart two weeks after last frost. Allow 3 feet between rows. Care: Needs plenty of water in early stages. Mulch with straw to protect against drought later in the season. Part Used for Tea: Fruit. Health writer Michael Castleman recommends 1/4 - 1/2 teaspoonful of dried red pepper per cup of boiling water for an infusion, taken after meals. By Infusion: Use 1/2 to 1 teaspoon pepper per cup of boiling water. Add 1/4 cup cayenne tea to 1 1/2 to 2 cups any other health restoration tea. Take warm 1 tablespoon at a time. Pour 1 cup boiling water over herbs and let steep 5 minutes. Sweeten with honey or ginger syrup.